WRENTHAM, Mass. 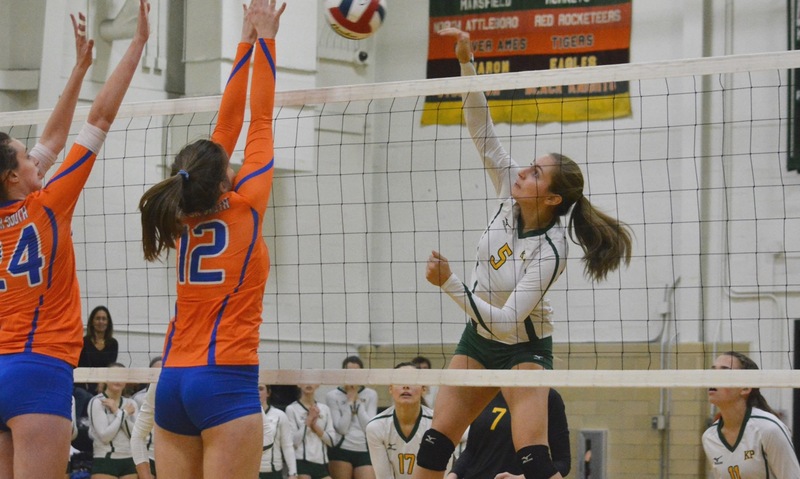 – It had been nearly two weeks since King Philip had taken the court for a meaningful game and there was noticeable rust, as Newton South jumped all over the Warriors in the opening set and held off a late rally to take a 1-0 lead in Tuesday night’s Div. 1 Central-East quarterfinal. KP shook off the rust from its 12-day layoff and turned the momentum around, winning three straight sets for a 3-1 (20-25, 25-23, 25-15, 25-23) victory and advancing to the semifinal. The Warriors also put themselves in early holes in three of the four sets, showing resiliency to bounce back including a rally from 8-2 down in the third set that saw KP win 23 of the next 30 points to put themselves within a set of a victory. 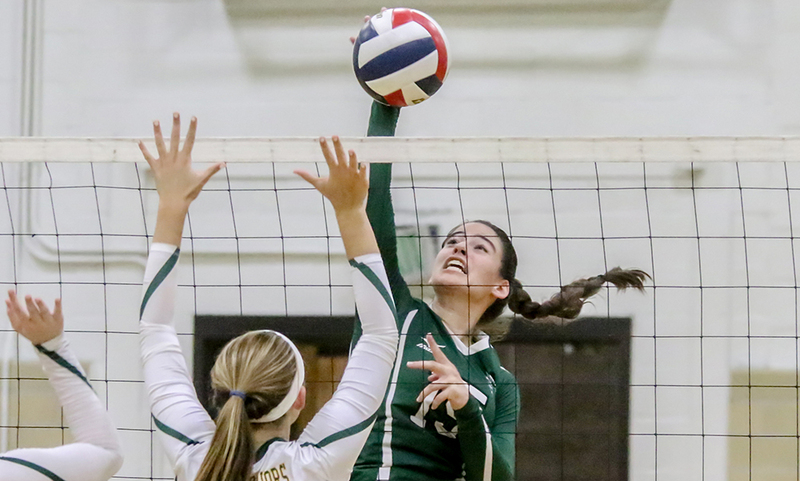 The first set was dominated by the height of the Lions at the net (three players over six feet tall) and the hitting of junior Ella Kim, who tallied nine kills in the opening set alone. 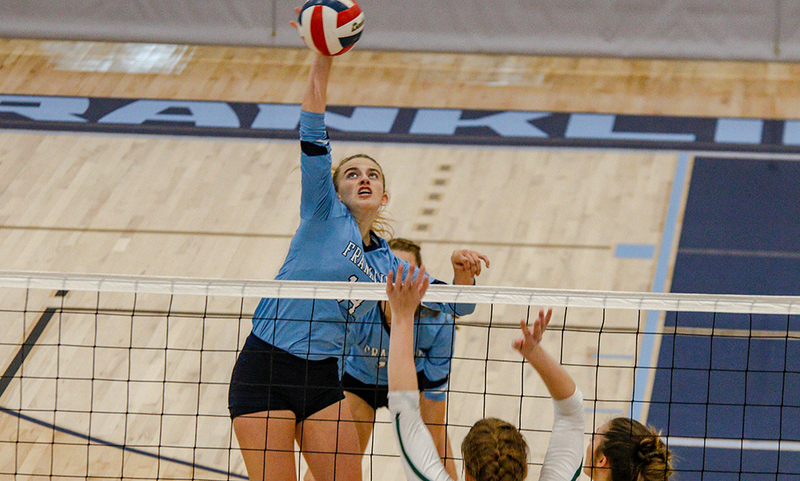 KP hung around in large part thanks to the play of junior hitter Sydney Phillips, who was recently voted the Hockomock League MVP by the coaches. Phillips had five kills and several service points in the set. In the second, KP again fell behind by a couple of points and the crowd was starting to get a little antsy, but a series of mishits by the Lions allowed KP to pull ahead. Back-to-back kills by Liv Balduf and Emma Lopez put the Warriors up 10-5. The Lions pulled back in front at 20-19 but another Lopez hit tied it and then she set up set point with another kill before Phillips tied the match with a blast. Newton South jumped all over the Warriors to start the third set with Kim again getting hot on the outside including a rip that made it 8-2 and had KP on the ropes. But the Warriors rallied again and started to put together a strong defensive effort highlighted by senior setter Carly Adams scrambling to one-hand a return while falling out of bounds and watching as it landed for a point on the other side. Adams was helped by Elise Pereira and libero Amanda Loewen (nine digs) in starting to stem the tide from Kim’s big hitting. Angela Vallente served six straight points to break the set open and give KP an 18-12 lead. Phillips added a pair of kills and then Kat Kmetz dug out back-to-back rockets from Kim to save a point at 22-13. Suddenly, the Warriors looked like the No. 2 seed and went into the fourth with confidence. For the first time in the match, KP also took an early lead in what turned out to be the final set. A Phillips ace made it 7-3. Two aces in a row from Balduf pushed the lead to 12-6 and great hustle by Pereira and Loewen to chase down a ball on the back line saved a point and stopped a Lions rally at 14-10. Kmetz followed that with two aces in a row. The Lions showed grit in battling back to keep the fourth set close, pulling to within 22-19 on a kill by middle hitter May Boucher. Facing match point, Newton South won four straight points to pull back within one but Phillips slammed the door on the comeback with a kill off the Lions block to seal the victory. This is the second season in a row that King Philip (19-2) has knocked out Newton South at this stage and now the Warriors get another rematch with the visit of No. 3 seed Quincy, which beat KP in five sets in last year’s semifinal.